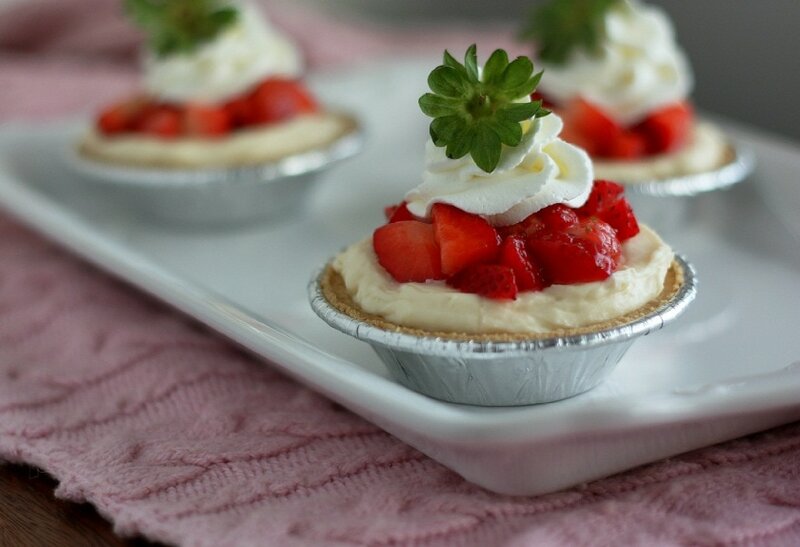 Easy Berry Cream Pies – made with store-bought graham cracker crust, an easy pudding filling then finished with strawberries and whipped cream. Delicious! Why pay for mint leaves when no one really eats them and they just end up straggling behind on the plate, then in the trash =)? If you didn’t notice I garnished these with the leaves of the strawberries rather than buying mint leaves just for looks. Not sure if they’re edible but they look fancy. I can’t get enough of these mini pies! 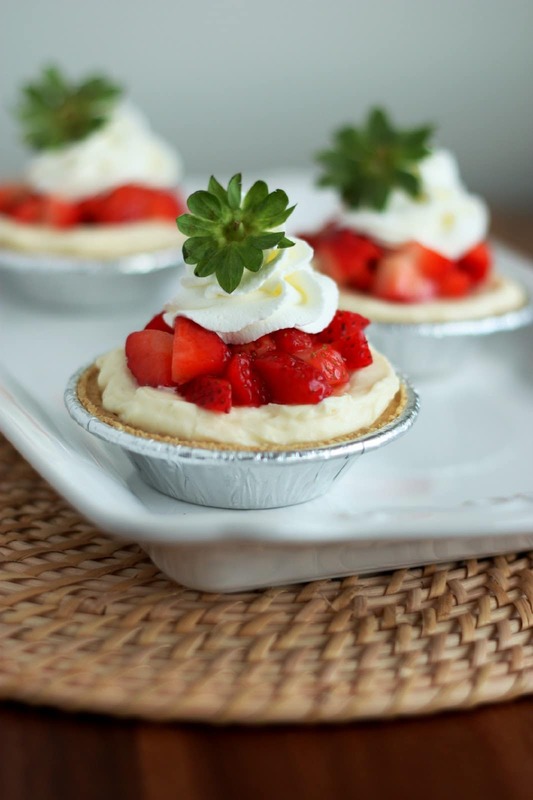 These are elegant, simple to make, luxuriously delicious, personal size cream pies that can be made in 10 minutes! I love the versatility of these pies. 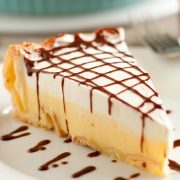 You could switch up the berries, and even use peaches or bananas (mmm love banana cream pie). I like to call the pastry cream I use in these, cheaters pastry cream because it tastes like pastry cream but its made from instant pudding in 2 minutes. 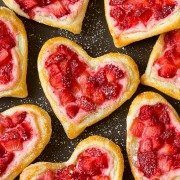 These pies are perfect for the upcoming Valentines holiday or anytime you need a delicious sweet! Make these for a party and allow everyone to believe you spent enduring, long, laborious hours in the kitchen for such a fine dessert =). made with store-bought graham cracker crust, an easy pudding filling then finished with strawberries and whipped cream. Delicious! In a mixing bowl, whisk together 1 cup heavy cream, milk, vanilla and instant pudding mix for 2 minutes until very thick. Cover and refrigerate. Dice strawberries into small pieces (if using raspberries dice into halves). Pour strawberries into a small mixing bowl and stir in 2 Tbsp powdered sugar, set aside. In a mixing bowl, with an electric mixer, whip together 1/2 cup cream until soft peaks form. Stir in 2 Tbsp powdered sugar then whip until stiff peaks form. Set aside. Remove pudding mixture from refrigerator, stir once more then fill each graham cracker crust with 1/4 cup mixture. 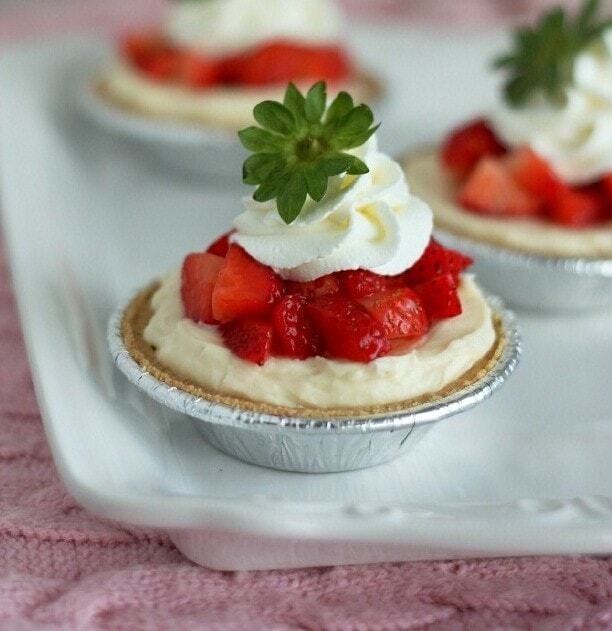 Smooth tops of pie then equally divide diced strawberries over filled pies (its a few heaping tablespoons over each). Pipe sweetened whipped cream over each pie. Serve immediately. 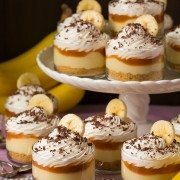 Simply Tia: I love how cute these look and I love how delicious it looks. Will be saving this to try for V-Day!